There are few activities as exhilarating as riding down the open road on a motorcycle. However, there are risks that go along with the thrill of the ride. Motorcycles by nature offer less protection than any other type of motor vehicle on the road. When motorcyclists are involved in accidents, especially collisions with other vehicles, the chances of being seriously injured or killed are therefore much higher than with any other type of motorist. In some cases, the motorcyclist is at fault for the accident and is thus liable for his or her own injuries, as well as any injuries caused to the occupants of the other vehicle in the event of a collision. However, all too often, innocent bikers are the victims of accidents caused by the negligence of other motorists who fail to do their part in sharing the road. In such instances, the injured motorcyclist may be able to recover compensation for his or her losses and expenses related to the accident by filing a personal injury claim against the negligent party. In the tragic event that the motorcyclist was killed in the accident, his or her family may be entitled to file a wrongful death claim. If you or a member of your family was harmed in a motorcycle accident caused by someone else’s negligence, the Provo personal injury attorneys of the Jones Waldo Personal Injury and Wrongful Death Practice Group, led by experienced attorney Lynn C. Harris, can help. Our Provo motorcycle accident attorneys have the skills, knowledge, and resources necessary to present the strongest personal injury case possible on your behalf, whatever the cause of the motorcycle accident. For further information about motorcycle accident litigation or to schedule an evaluation of your case, please contact our personal injury law firm in Provo today. 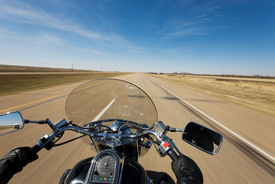 Motorcyclists have the same rights as any other drivers on the road. If you or a member of your family has been seriously injured, or if you have lost a loved one, due to the negligent actions of another motorist, a defective product, or any other result of someone else’s poor judgment or negligence, please call, email, or visit our personal injury attorneys in Provo, Utah today.